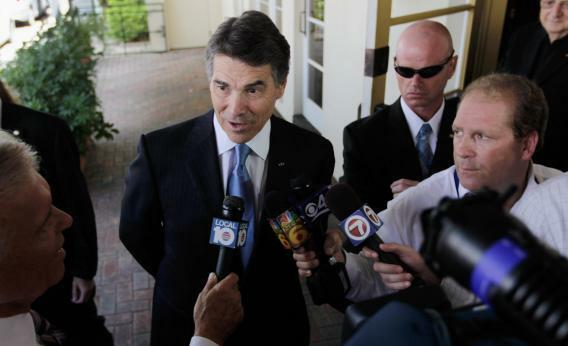 Texas Governor and Republican presidential contender Rick Perry speaks with the media after attending a private campaign event at the Riverside Hotel. And then he fell a little flat. Perry took the stage with his wife Anita, “a great first lady,” who stayed by his side for all 12 minutes of the speech. Newt Gingrich had just joked about how the stage lacked a teleprompter, but Perry could have used it. Without it, he read at a measured pace from notes that he frequently referred to. His speech pattern reminded me of a program on my computer that lets me play back audio slowly. He seemed to be speaking at 85% speed. Applause, but not as much as he’d gotten when his name was announced. That worked. “Romney!” snickered Jack Dearmin, a county official from nearby Polk, who was standing near the stage with me. But Perry sounded bored, repeating lines from his stump with no great enthusiasm. “Some people say that America’s in decline.,” he said. “I disagree. I say Washington, D.C.’s in decline.” S’m p’pl. Washin’tn. Perry only connected at the end, as he seemed to start in on a discussion of the death penalty. One of the killers of James Byrd had been executed just 22 hours earlier. “I’ve had to make a great many decisions of consequences over the years,” he said. I couldn’t have done so without being driven to my knees on many occasions. As I campaign for president, I not only ask you for your support. I ask you for your prayers.” That worked, and Perry came to life as he worked the crowd. But more than one person in my gaggle around the stage speculated (or hoped) that he was reserving energy.